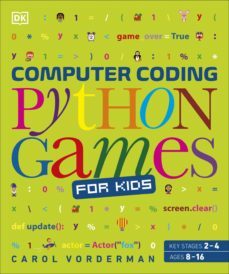 Learn how to code in Python by building and playing your own computer games, from mind-bending brainteasers to crazy action games with explosive sound effects and 3D graphics.Whether youre a seasoned programmer or a beginner hoping to learn Python, youll find Computer Coding Python Games for Kids fun to read and easy to follow. Each chapter shows how to construct a complete working game in simple numbered steps. Using freely available resources, such as PyGame Zero and Blender, you can add animations, music, scrolling backgrounds, 3D scenery, and other exciting professional touches.After building the game, find out how to adapt it to create your own personalised version with secret hacks and cheat codes!Along the way, youll master the key concepts that programmers need to write code - not just in Python but in all programming languages. Find out what bugs, loops, flags, strings, tuples, toggles, and turtles are. Learn how to plan and design the ultimate game - and then play it to destruction as you test and debug it. Before you know it, youll be a coding genius!